The area was visited by the Spanish in the 1600s and the east coast was explored by Captain Cook. The area was initially part of New South Wales. Following agitation, for seperation, in the 1850s, the area was granted self-government on 13 May 1859. On 10 December Queensland became a colony. In 1901 Queensland was federated into the Commonwealth of Australia. While it was still part of New South Wales, Post Offices were opened in Brisbane (1834) and in White (1842). Further office continued to be opened, such that when Queensland became a Colony, in December 1859, there were a total of 15 Post Offices. Each was allocated a numeral canceller in the New South Wales series. When new offices were opened then they were allocated new numeral cancels by Queensland. These cancels remained in use till 1915. New South Wales stamps were used from 1851 while the area was still part of New South Wales. The first Queensland stamps were issued on 1 November 1860. The first postal stationery were postcards which were introduced in 1880, followed by newspaper wrappers in 1891, letter cards in 1895 and registered envelopes in 1911. Late in 1891 a new Post and Telegraph Act became operative in Queensland. This introduced a newspaper rate of ½d per 10 oz within the colony and ½d per 2oz intercolonially. Prior to the introduction of the 1891 Act newspapers had been carried post free within Queensland. Newspaper wrappers were issued on 25 November 1891 but were not valid for use untill 1 January 1892. Thursday Island, a Queensland dependency, was a popular port of call for many shipping lines operarating in this area. Its numeral cancels (51, 136, 148 and 336) can be found on stamps of many countries, as transit markings or posted on board ship. 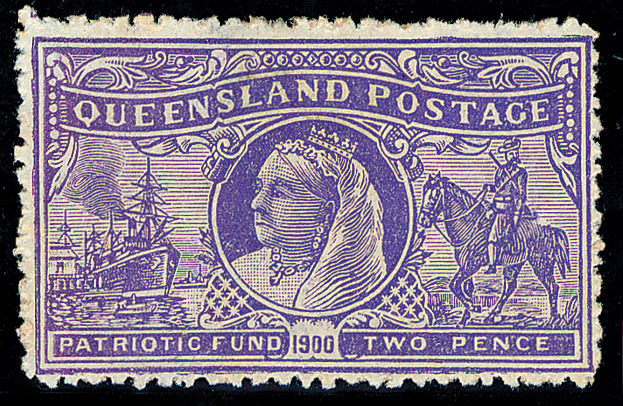 Stamps of Queensland were used in British New Guinea between 1884 and 1891. Queensland joined the UPU in 1891. When Queensland became part of the Commonwealth of Australia it continued to use its own stamp until Australian stamps were issued in 1913. The Society holds bi-monthly meetings. The Society publishes the Australian Journal of Philately. The Society of Australasian Specialists was founded in July 1936 by a small group of collectors interested in Australasian philately. In 1965, the American Society of Australian Philatelists, later to become Oceania, Inc. was established for the same purpose as the older SAS. In 1978, the two Societies consolidated to better serve the members of both organizations. Today, the Society has many members, not only in the United States and Canada, but also in New Zealand, Australia, Great Britain, and a few other countries. The Society was founded in 1933 as a correspondence Society. It was re-formed as a traditional Society in 1946 and named "The Australian Commonwealth Specialists Society of Great Britain" holding regular meetings in London. In 1970 a new constitution was adopted and the name was changed to "The British Society of Australian Philately". It embraces collectors of all periods of Australia, from the Colonies to the present day. The Club was formed in 1987 and currently has about 150 members. Members' interests include the Official and private perfins of Australia and New Zealand of all periods. This blog is devoted to the 1st Queensland sideface stamps (1878/9-1881), a fascinating aspect of Queensland philately. There were five issues, 1d reddish brown / scarlet, 2d blue, 4d yellow, 6d green and 1 shilling violet / lilac, also a 1d overprint and 1d stamp duty. What's a 10 bar Queensland Railway Numeral I hear you say! Each post office in Queensland was issued a number and a numeral canceller to cancel the stamps with. These had 9 bars, the railway was issued with numeral cancellers similar to the post office but these had 10 bars. All postage stamps were supposed to have been cancelled with the 9 bar and the 10 bar was for cancelling the railway parcel stamps, as the two were so similar confusion reined and they were easily mixed up. Project covering the origin of some 3,500 place names for Far North Queensland including the Torres Strait and Cairns. "Bernie Manning has worked with a number of other enthusiasts to access as much material as possible to ensure that both his coverage and his rarity ratings are as accurate and reliable as possible. The book is extensively illustrated entirely in colour, using the best available strikes of the postmarks. This will greatly assist collectors to identify any questionable markings..."